Mr. President and The First Lady were spotted hard at work Saturday afternoon. The cams went live much earlier this season -- which means things are going to get pretty personal. Viewers will be able to see the eagle pair mating and the female laying eggs, the American Eagle Foundation said. 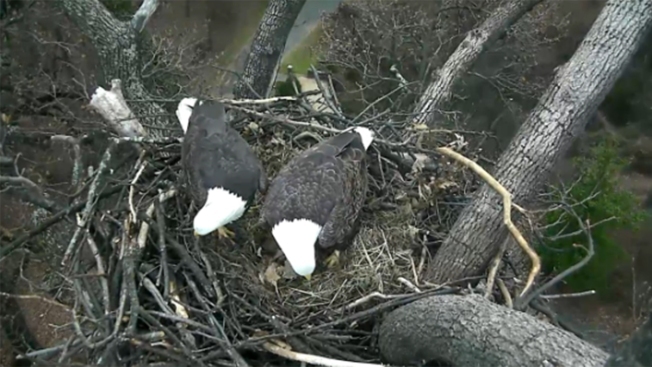 The DC Eagle Cam is back! Workplace productivity likely took a major hit in the D.C. area last spring after two eaglets hatched at the National Arboretum. The region was captivated as they watched as two babies chipped out of their shells, gulped down tiny bites of fish from their parents and learned to fly. The 2016 eaglets, named Freedom and Liberty, are now grown and off on their own -- but their parents returned to the nest in the fall and are busily preparing for the possibility of a new batch of babies, the American Eagle Foundation said. The eagle parents, Mr. President and The First Lady, "have been tirelessly carrying-out nest building activities ('nestorations') and adding hundreds of sticks and other soft materials to the interior of nest," the foundation said in a release Friday. The cams went live Saturday to stream the new breeding season, with a major upgrade: The cams now include live sound. In addition, the cams have gone live much earlier in the season. Last time, they didn't begin streaming until mid-February, at which point the parents were already incubating their eggs, the foundation said. This year, things are about to get much more personal: "...[V]iewers will get to observe the pair copulating and preparing the nest for their young, as well as watch The First Lady laying eggs," the foundation said. The eagles are the first pair to nest in the National Arboretum since 1947. They had one baby in 2015 and two this past year. Eagles typically lay one to three eggs each year, the foundation said. The foundation said the DC Eagle Cam has had more than 60 million views during the five months the camera was live in 2016.